Tick, tick, tick… the clock turns 10, the time has come. The first model, covered from head to toe in dazzling body graffiti, dressed in nothing but a pair of showgirl knickers, elaborate headpiece and chains of jewelry, draped from one hand to another reminiscent of Erté’s illustrations. As she paces across the show set to a soundtrack that sways from funeral march to dark cinematic sounds, she passes by echoes from the past. 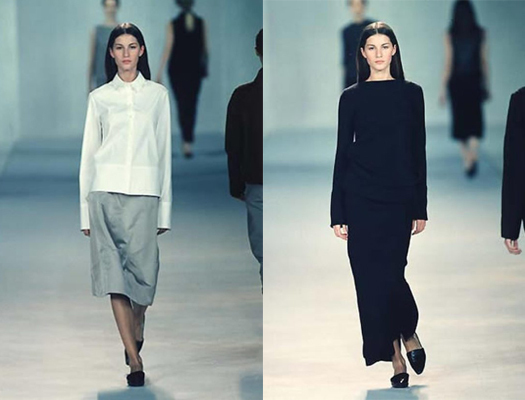 The carousel from s/s 2012, the escalators from s/s 2013, the fountain from s/s 2011, the hotel corridor from a/w 2013 and the elevator from a/w 2011, like the greatest hits, these references from previous season remind of moments of glory, except now, everything is blackened out. 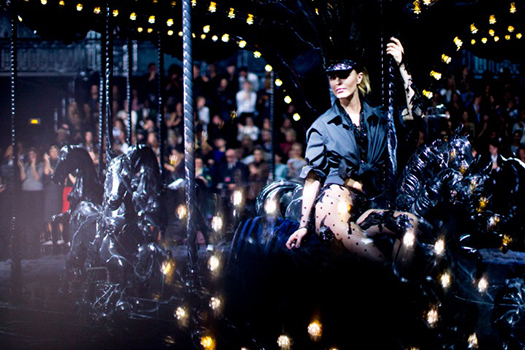 This show, the last one directed by Marc Jacobs for French luxury leather goods brand Louis Vuitton, for all its funeral-like darkness and gloom is in fact a cause for celebration. Looking at Jacobs’ work now and it feels archaic, his reference point to early 20th century showgirl for this last show seems like a perfect metaphor to all of this. What began as an era of excess with orientalism, Paul Poiret and Ballets Russes soon turned to the success of Chanel as time changed and women’s need for practicality outshone everything that was ornate and decorative. Now, the new generation of designers, Proenza Schouler, Alexander Wang and J. W. Anderson are more about wearability, material innovation and very commercial design thinking rather than theatrics. Whilst Jacobs has been creating exquisitely crafted fashion, the over elaborate detail and costume reference points has meant that beyond the huge trend influence they have on mass-market sector, the actual clothing is nowhere to be seen beyond magazine shoots and catwalk. It is common knowledge that Louis Vuitton makes their money with handbags, the clothing and the shows acting merely as an elaborate and very expensive backdrop, but I wonder if the clothing could play a bigger part of this fashion empire. One only has to look towards Kim Jones’ work at the menswear side of the business to see that it is possible. Whether you see Marc Jacobs’ last show for Louis Vuitton as a funeral or a celebration, is of course up to you. I for one have already ordered the lilies and am looking forward to the next chapter, both for Louis Vuitton and fashion system in general.